Check the core plate for damage. 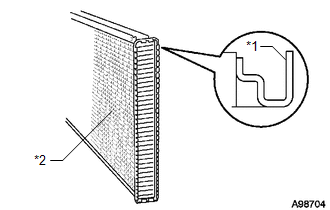 If the sides of the core plate groove are deformed, it is impossible to reassemble the radiator tank. Therefore, first correct any deformation using pliers or a similar tool. Water leakage will occur if the bottom of the core plate groove is damaged or dented. Repair or replace the core plate if necessary. The radiator assembly can only be caulked twice. After being caulked twice, the radiator assembly must be replaced.